The Browns and Perriman mutually agreed to cancel their plan to sign a contract, and the Buccaneers have agreed to sign Perriman to the same one-year, $4 million deal, Adam Schefter of ESPN reports. Analysis: Not long after the Browns' trade for wide receiver Odell Beckham was reported Tuesday, rumors stirred that Perriman wanted out of Cleveland after agreeing to a contract earlier in the day. The Browns granted his wishes. Perriman will compete for snaps in Tampa Bay behind Mike Evans and Chris Godwin, while DeSean Jackson (Eagles) and Adam Humphries (Titans) will head to new teams. Perriman is re-signing with the Browns on a one-year, $4 million contract, Adam Schefter of ESPN reports. Browns general manager John Dorsey said he wants to re-sign Perriman, who is scheduled to become a free agent, Scott Petrak of the Elyria Chronicle-Telegram reports. Perriman hauled in two of four targets, posting 76 receiving yards during Sunday's 26-18 win against the Bengals. Perriman caught one pass on two targets for 31 yards and a touchdown during Saturday's 17-16 win over the Broncos. 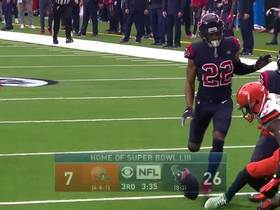 Analysis: For the second straight week, Perriman made an impact on the first drive of the game when Baker Mayfield found him for a 31-yard touchdown. While the duo has connected on two deep passes in the last two weeks, Perriman's involvement in the offense remains limited. Still, he has shown he has the ability for the big play, and Mayfield isn't afraid to chuck it deep to him. Perriman will look to find the end zone for the second time in 2018 against the Bengals in Week 16. Perriman caught both of his targets for a team-leading 81 yards during Sunday's 26-20 win over Carolina. Perriman hauled in both of his targets for 26 yards in Sunday's 29-13 loss to the Texans. Analysis: Perriman has been targeted in all seven of his games with the Browns this season, though he has only surpassed two targets once. The 25-year-old wideout has eight receptions for 107 yards on the season but doesn't figure to be a key piece of the offense going forward. Perriman hauled in his only target for six yards during Sunday's 35-20 win over the Bengals. Analysis: Though Perriman played over half of Cleveland's offensive snaps, he struggled to get involved, as is evident by his sole target. He seems to have leaped over Rashard Higgins on the receiver depth chart, but he's just not involved enough to merit a roster spot in the majority of fantasy formats. Perriman caught both of his targets for 33 yards during Sunday's 28-16 win against the Falcons. Analysis: Perriman played only 13 offensive snaps, but he made them count with two catches. He remains buried on the depth chart, though he did out-snap Damion Ratley, which comes as a new development. Barring an injury to either Jarvis Landry or Antonio Callaway, however, Perriman -- who has five catches for 75 yards this season -- shouldn't be considered as a fantasy option. Perriman caught two of six targets for 36 yards in Sunday's 37-21 loss to the Chiefs. He also rushed twice for nine yards. Analysis: Despite being on the field for just 35 percent of Cleveland's offensive snaps, Perriman finished third on the team in targets. This comes after a Week 9 game in which he finished without a catch. The former first-round pick has three receptions for 42 yards on the year. Perriman failed to haul in his lone target during Sunday's 33-18 loss to the Steelers. Analysis: Perriman played just nine offensive snaps, as he continues to be buried on the depth chart. The Browns signed Perriman in order to provide much-needed depth to their receiving corps, but so far it's Damion Ratley who's being utilized. Perriman's role could shrink further if Cleveland lands a wideout before the trade deadline. 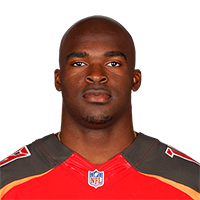 Perriman caught his only target for six yards during Sunday's 26-23 loss to the Buccaneers. 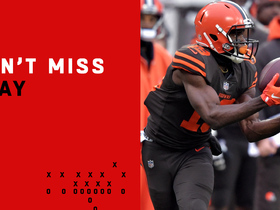 Analysis: Perriman made his debut with the Browns on Sunday, and while he played just 11 offensive snaps, he still managed to come away with a reception. 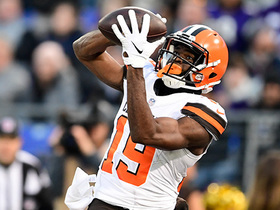 The Browns are desperately struggling at receiver depth, meaning Perriman could begin to see more opportunities going forward. The 25-year-old is in his fourth season and has 44 receptions for 582 yards in his career. Perriman is listed as active Sunday against Tampa Bay. Coach Hue Jackson said Perriman could have a significant role during Sunday's game against the Buccaneers, Mary Kay Cabot of The Cleveland Plain Dealer reports. Perriman is listed as inactive Sunday against the Chargers. Analysis: Perriman was just picked up by the Browns on Saturday, so it's no surprise to see him left off the active roster the following day. He'll look to get better acclimated with the offense this week in hopes of being able to contribute Week 7 in Tampa Bay. In the meantime, Cleveland will move forward with Jarvis Landry and Antonio Callway as the top options at wide receiver, as Rashard Higgins (knee) is inactive Week 6. The Browns signed Perriman to a contract Saturday, Nate Ulrich of the Akron Beacon Journal reports. Analysis: Perriman, a 2015 first-round pick, spent his first three seasons in Baltimore. He has worked out with several teams since getting cut by the Ravens prior to the season kicking off, but nothing stuck until now. With Rashard Higgins (knee) and Derrick Willies (collarbone) out for Sunday's matchup with the Chargers, Perriman is expected to provide depth at at receiver. Perriman worked out for the Patriots on Thursday, Mike Reiss of ESPN.com reports. Analysis: The 2015 first-round pick was cut by the Ravens at the end of the preseason and released by the Redskins last week. The Patriots are probably just updating their emergency list, as they recently traded for Josh Gordon and will get Julian Edelman back from suspension next week. Perriman was let go by the Redskins on Saturday, John Keim of ESPN.com reports. Analysis: Washingon scooped Perriman up earlier in the week, but his stint with the club will be short-lived. The team has opted to add more running back depth ahead of Sunday's game against the Packers, and Perriman was ultimately the odd man out. The 25-year-old pass catcher spent his first three seasons with the Ravens, but is once again looking for a new opportunity. Perriman is signing a contract with the Redskins, Adam Schefter of ESPN reports. Analysis: Perriman appears to be a consolation prize for the Redskins, who were reportedly in the mix to acquire Josh Gordon from the Browns earlier Monday. In any case, the 2015 first-rounder will now try to resuscitate his career with a Washington team that currently has a solid receiving corps headlined by Jordan Reed, Jamison Crowder and Paul Richardson. It's not clear what sort of role Perriman will have out of the gates. Perriman is working out with the Eagles on Monday, Adam Schefter of ESPN reports. Analysis: A first-round pick in 2015, Perriman has been a tremendous disappointment in his NFL career. He still has some potential that made him such a prized prospect and could be a contributor for Philadelphia if it chooses to sign him. If he does sign with the Eagles he'd likely have a depth role early on with a possibility of working his way up the depth chart. Perriman was waived by the Ravens on Saturday, Adam Schefter of ESPN reports. Analysis: Selected 26th overall in the 2015 draft, Perriman missed his entire rookie season with a knee injury and caught just 43 of 100 targets the past two years. He began playing special teams in a last-ditch effort to stick around, but there was never much chance the Ravens would keep him unless their wideout depth chart took a major hit from injuries. The 24-year-old did catch 11 passes for 136 yards and a touchdown this preseason, albeit with a couple drops mixed in. Perriman is receiving work in practice as a gunner on special teams, Kyle Andrews of the Ravens' official site reports. Analysis: The Ravens are pulling out all the stops to give their 2015 first-round pick a shot at sticking on the 53-man roster. Perriman is unlikely to land any higher than fifth on the depth chart at wideout, but he's at least making an argument to stay on the team with six catches for 99 yards and a touchdown on eight targets through three preseason games. Tim White, Jordan Lasley and Jaleel Scott are also in the mix for the final two spots at receiver. Perriman hauled in three of four targets for a game-high 71 yards and a touchdown in Thursday's preseason win over the Rams. Analysis: This was as good as Perriman has looked in recent memory, but it's worth noting that he didn't see the field until the second half. The highlight of his night was a 32-yard touchdown grab where he made an impressive adjustment in the end zone. He still has his work cut out for him in terms of making the 53-man roster, but his main competitors -- Jordan Lasley and Tim White -- were either quiet or injured Thursday, so Perriman certainly gained some ground with his performance. Perriman caught two of three targets for 19 yards in Thursday's Hall of Fame Game against the Bears. Analysis: Perriman did make a couple of nice plays in the first half, but it wasn't enough to make up for an interception on a short pass that slipped right through his hands. Even after collecting a $649,485 roster bonus in July, the 2015 first-round pick seems to be on the wrong side of the roster bubble. The Ravens intend to pick up Perriman's $649,485 roster bonus for 2018 on Saturday, Jamison Hensley of ESPN.com reports. Perriman is not expected to have his fifth-year option picked up by the Ravens on May 5, Jamison Hensley of ESPN.com reports. Perriman ended the season with 10 receptions for 77 yards and no touchdowns on 35 targets across 11 games. Perriman (coach's decision) is listed as inactive Sunday against the Bengals. Analysis: Perriman has seen 30 or more snaps in each of the last two weeks, as regular starter Jeremy Maclin has been limited by a knee ailment. Maclin was ruled inactive as well Sunday, so it's a bit surprising to see Perriman as a healthy scratch. With both wideouts on the shelf, Baltimore is left with Mike Wallace as their top pass-catching option, while Chris Moore and Michael Campanaro attempt to fill the remaining void. Perriman (coach's decision) is listed as inactive for Week 13's matchup against the Lions. Analysis: Perriman will be a healthy scratch for the second time in three weeks, surrendering his spot on the active roster to WR/KR Michael Campanaro. Perriman's playing time had been trending downward anyway, as he saw just 16 snaps in Week 12's win over Houston. He's been active nine games this season, but has gone without a reception in five of them. Perriman played 16 snaps on offense and was held without a catch on two targets in Monday's 23-16 win over the Texans. Analysis: A healthy scratch the previous week, Perriman returned to the lineup with his lowest snap count of the season. His utter lack of production this season -- seven catches for 54 yards on 29 targets -- essentially has forced the Ravens to insert Chris Moore as the No. 3 receiver. Perriman likely would have been demoted long ago if he weren't a recent first-round pick. As is, he'll likely have to fight for a roster spot in training camp next year, assuming he's still with the team. Perriman is listed as active for Monday night's game against the Texans. Analysis: Perriman, who last suited up Week 9, returns to the mix after a one-game stint as a healthy scratch. To date, the 2015 first-rounder has been limited to seven catches on 27 targets for 54 yards over the course of eight games. Perriman has much to prove before gaining fantasy utility, but perhaps his Week 11 benching will help spark the wideout's production down the stretch. Ravens coach John Harbaugh said Perriman will be back in the lineup at some point this season, Jeff Zrebiec of The Baltimore Sun reports. Perriman is inactive for Sunday's game against the Packers. Analysis: He's a healthy scratch, so it remains to be seen if Perriman's demotion extends beyond Week 11. On Sunday at least, Michael Campanaro is a candidate for added wideout reps, working behind starters Jeremy Maclin and Mike Wallace. The Ravens, who play against the Packers on Sunday, are expected to demote Perriman, according to NFL Network's Ian Rapoport. Analysis: It remains to be seen whether that would lead to the wideout being a healthy inactive Sunday or simply result in Perriman being less involved in the team's attack after seeing work on 46 percent of the Ravens' snaps on offense in Week 9's loss to the Titans. While the demotion may end up being a one-week deal, per the report, on Sunday it could lead to added reps for follow receiver Michael Campanaro, working behind starters Jeremy Maclin and Mike Wallace. Perriman pulled in three of seven targets for 28 yards in Sunday's loss to the Titans. Analysis: The third-year wideout broke out of his two-game drought without a catch to record his best game of the season. Perriman had all of four catches for 26 yards entering Sunday. It's clear that Baltimore is trying to get Perriman the ball more, as evidenced by his season-high seven targets Sunday, but the added looks aren't being converted into production efficiently. Perriman and the Ravens will be on a bye this week before returning to action against the Packers. 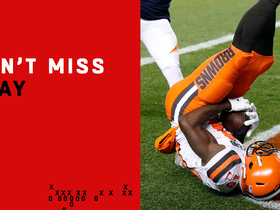 Cleveland Browns wide receiver Jarvis Landry takes a trick play and passes the football deep down the field to Breshad Perriman for a gain of 63 yards against the Cincinnati Bengals in Week 16 of the 2018 NFL season. Cleveland Browns wide receiver Breshad Perriman spins for a dramatic 31-yard touchdown catch. 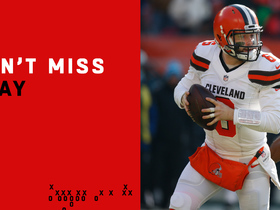 Cleveland Browns quarterback Baker Mayfield launches a 66-yard pass to wide receiver Breshad Perriman. 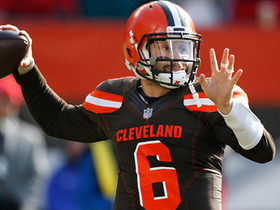 Cleveland Browns rookie quarterback Baker Mayfield lasers pass to wide receiver Breshad Perriman. 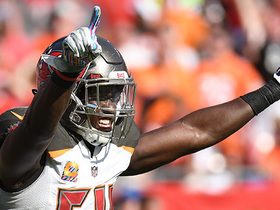 The entire Tampa Bay Buccaneers' defense is hyped up after big tackle by lineabacker Lavonte David. 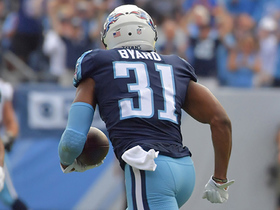 Kevin Byard snags the interception after Logan Ryan deflects the long pass attempt. 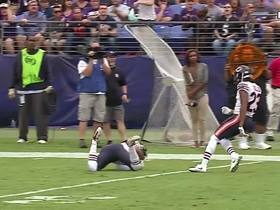 Chicago Bears cornerback Bryce Callahan interrupted the route between Joe Flacco and Breshad Perriman for a Bears interception.